The Magnificent Seven remake has a new trailer and it looks even more promising than previously thought. Denzel Washington stars as Chisolm, a bounty hunter recruited by Emma Cullen (Hayley Bennett) to even the score of her fellow townspeople against oppressive industrialist Bartholomew Bogue (Peter Sarsgaard). He assembles a strike force of six other fighters and desperadoes: Josh Farraday (Chris Pratt), Goodnight Robicheaux (Ethan Hawke), Jack Horne (Vincent D’Onofrio), Billy Rocks (Byung-Hun Lee), Vasquez (Manuel Garcia-Rulfo), and Red Harvest (Martin Sensmeier). The seven are vastly outnumbered by Bogue’s cronies, but they love to think on their feet, blow stuff up, and, in the case of Sam, shoot people while hanging sideways off a moving horse. Should make for an even fight. 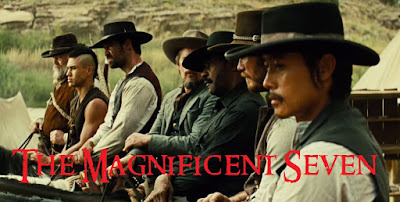 The Magnificent Seven hits theaters September 23rd, 2016.